Before you get your body moving and sweating, you need to fuel it. Energy and powerful nourishment are non-negotiable when it comes to your pre-workout prep. That's where green smoothies come in. Great pre-workout green smoothies are stocked up on healthy fats with a moderate amount of carbs and protein, helping you power up for a serious session. Bananas are loaded with carbohydrates that help energize your body and put you in an extra-good mood, which is perfect for a pre-workout buzz. Bananas also contain tryptophan, which your body converts to serotonin. Serotonin is a chemical the body creates for a natural mood booster. You can see why we put bananas at the top of our list. Oats make this list for one simple fact: They take a long time to digest. This means that they provide long-lasting energy during your workout. Oats also help maintain stable blood sugar levels during your workout, which is always a good thing. 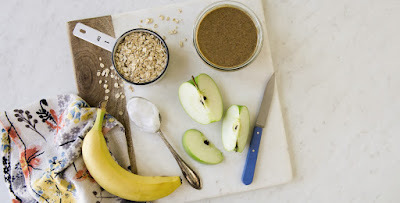 You can add dry oats, soaked oats, or even cooked oats to your smoothie. We usually recommend adding 2 tablespoons of dry oats or 1/4 cup of cooked oats to any green smoothie recipe. Apples contain a powerful antioxidant called quercetin. Quercetin’s main role in the body is to deliver more oxygen to the lungs. When you get more oxygen to your lungs during a workout, you have greater endurance. This makes it so much easier to get through that hour-long Spin class! If you’re exercising for weight loss, then coconut oil will be an important ingredient for you. The fatty acids in this superfood fight body fat by converting into energy that boosts your metabolism (as opposed to saturated fats that put on body fat). Add coconut oil to your green smoothie before you work out to help fight body fat. We add 2 tablespoons to our green smoothie recipes. The best reason to eat nut butter before a workout is because it’s loaded with healthy fats and fiber, which keep you feeling full and energetic throughout your entire workout. There are many kinds of nut butters to choose from, but our favorite is almond butter. We add 2 tablespoons to our smoothies all the time—yum!